We are the proud parents of a loving, compassionate, friendly, social and funny 14 year old girl. When Grace was born we did not know she would have Down syndrome. We are lucky to have the Down Syndrome Association of Delaware be a part of our lives! We have enjoyed attending family social events, parent education meetings, the Run for the Buds and the Buddy Walk. We feel fortunate to have met such great advocates through the organization. Talking with families who have traveled this road before us have been a great resource, so we thank you all! Grace is currently a freshman in high school. Her first year of high school is going well. The journey through the education system has not always been easy though. It is never easy to hear what your child is not capable of doing or that they are below grade level in core subjects. The compliments we have received about Grace have always outweighed the negative which is fantastic! Only this morning Grace and I met with her guidance counselor to discuss what courses she would like to take next year. I love that they asked her what her interests are and then explained what courses they thought she would enjoy. Our goal for her high school years is for her to have the fullest high school career possible. Since Grace loves sports we have made it possible that she has been a part of the high school volleyball team and the basketball team – which she played in 2 games and scored points! She will participate in soccer in the spring too! Grace is very active outside of school too. She has been taking piano lessons for 8 years and loves music! Her favorite band is One Direction. 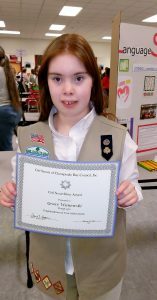 She is a Girl Scout Senior and just earned her Cadette Silver Award which is the highest award for a Cadette to earn! She also has been taking horse back riding lessons for 11 years. She is a Speical Olympic Athlete where she participates in bowling, soccer, basketball and swimming. It has always been important to us to have Grace involved in many activities. Our hope is for her to have a positive impact on those she meets. To show everyone that she is more alike than different. A few weeks ago the high school had 1/2 days and I had to work. So I had Grace come to the elementary school where I work. The weather happened to be too cold for outside recess so we stayed in and when I went into the classroom with Grace all of the students came over and introduced themselves to her and immediately asked her to join them in their activities! It warmed my heart to know that the youth of today do not pass judgement and are accepting and caring. Grace has hopes and dreams just like everyone else. In 7th grade she started to attend her IEP meetings. Prior to the meeting she sat with the ED and went over a career guide and she had to answer questions about her future. Her answer was and still is that she would like to work with horses or babies. 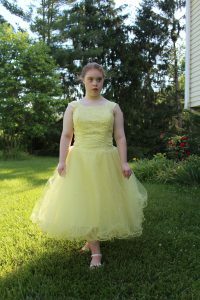 She wants to go to college and to live independently. She now has to work on life skills to get her dreams to come true (which is much easier said than done but we are working on it.) One of her goals is to also marry one of the boys from One Direction or Like Evans! So now we plan for her future. Reminding her that having dreams is wonderful but that not all dreams can come true is the difficult part. We hope that as many of her dreams come true as possible and we will do what we can to make that happen! Bio: Lisa Wisnewski is married to Joe and has one child, Grace. She is a part time paraprofessional in the Appoquinimink School District. Lisa is a past member of the Down Syndrome Association of Delaware Board of Directors where she served as secretary for 8 years, she has been an active member of the Buddy Walk Committee for 14 years and helps the DSA with volunteers for all of our events.